Reuniting Director David Mackenzie and Chris Pine after their successful collaboration in HELL OR HIGH WATER, OUTLAW KING is set in Scotland in 1304 and recounts the story of Robert the Bruce (Pine). First, he submits to being governed by England’s King Edward I, then marries the King’s goddaughter Elizabeth (portrayed sublimely by Florence Pugh) and ultimately rallying Scottish supporters (that include Aaron Taylor-Johnson and Tony Curran) to be crowned the first king of Scotland. In the interest of full disclosure, I admit that I am generally not a fan of Historical Dramas as many movies presume you have a working knowledge of their royal lineage, foibles, assignations, religious beliefs, enemies and so on. It feels like, once again, I am unprepared for a History exam. 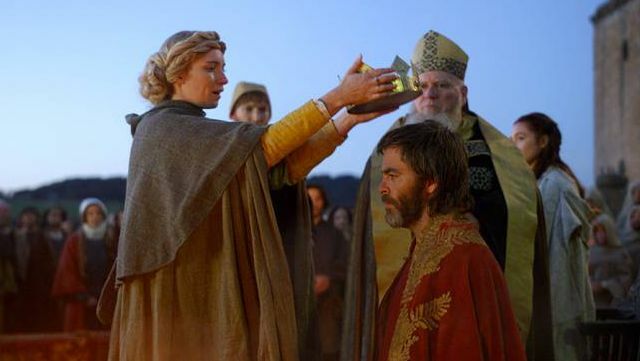 In OUTLAW KING, not only is there a King Edward (a voracious Stephen Dillane), there is his son, Prince Edward (an over-the-top, feral performance by Billy Howle in a ridiculous bowl haircut that makes Javier Bardem’s do in NO COUNTRY FOR OLD MEN look positively Vidal Sassoon). There’s a huge array of men that are either brothers or cousins or nephews or uncles that keeping score of who is who to who, is a chore. When one is captured by the Brits and is gutted like a pig ready for a roast, sympathy is evoked, but for unexplained reasons. Darkness, mud and rain frame the majority of the scenes filmed in widescreen and often times it feels like there may have budgetary constraints to fully take advantage of the glorious Scottish countryside and towns. The battle scenes are numerous and grisly, hyperkinetically-filmed in a cacophony of flaming arrows, hatchets, swords and galloping horses. It is relentless and hypnotic with rivers of blood flowing and mixing in with the mud. I feel that David Mackenzie’s vision may have been compromised with having five people Writers working on the Screenplay. There was a lot of exposition that needed to be realized at the expense of clarity and brevity and, at times, the dialogue felt out-of-place for the times depicted. However, his ability to bringing-out performances that resonate is impressive. One might not ordinarily picture Chris Pine as a lead in a gritty epic, but he exceeds expectations – his performance is nuanced and incredibly-good. He’s believable as a violent warrior and a loving husband. The real win is Florence Pugh; she is glorious and proves her magnetic performance in last year’s LADY MACBETH was no fluke. Despite my reservations, OUTLAW KING is a pleasure and educational, if only to make me go home and Google the history of Robert the Bruce and Scotland’s quest for independence. Netflix stream OUTLAW KING Friday, November 9, 2018. You also can catch it for a limited time now on TIFF Bell Lightbox.